The original steam free milk foamer from Aerolatte is now available in an attractive and durable stainless steel casing. 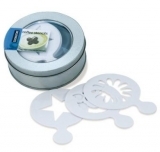 The Aerolatte comes complete with a stainless steel stand to display next to your home coffee maker. Working directly in the mug or glass, the stylish Aerolatte milk foamer takes just 20 seconds to turn a small amount of hot or cold milk into the perfect froth for cappuccinos, caffe lattes, mochas and specialty coffees as well as hot chocolates, malts and milk shakes. The original steam free milk foamer. For Matcha tea, Matcha lattes, Chai Latte, earl grey latte. Two AA batteries are included. Aerolatte founders Alan and Gary set out to give anyone the chance to enjoy a latte or cappuccino with a healthy foam on the top without the need for an expensive coffee machine. So they created a solution - the aerolatte. Created with a passion for great coffee and frothy milk drinks, the aerolatte 'the original steam free milk frother' is a huge success and a firm favourite among top chefs, keen foodies and coffee lovers alike. In essence, aerolatte truly changed the way we enjoy cappuccino, caffe latte, milkshakes and hot chocolates at home. Aaerolatte's success has meant consumers can now achieve professional results at home in a simple and easy manner. 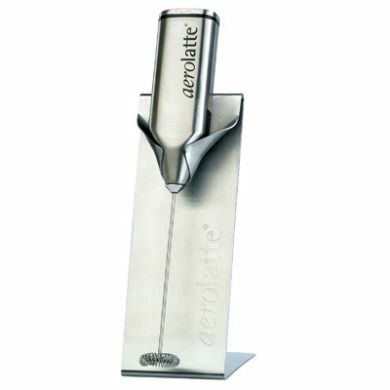 Sorry - We are out of stock of Aerolatte Deluxe - Stainless Steel Frother With Stand.